I love residential life on Hope College’s campus maybe just a little too much. Over the last three years of living on Hope’s campus, I have enjoyed spending the last two being a Resident Assistant (also affectionately known as a R.A.) to the women of Phelps Hall and Mayor’s Cottage. Living on-campus has shaped me to be a much better person than I was when I entered college. However, I never would’ve expected that to be the case during my freshman year. 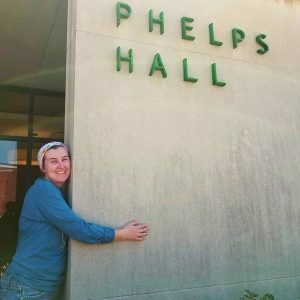 Abigail Brummel is a junior and former resident of Phelps Hall. When I decided to attend Hope my senior year of high school, I didn’t really know anyone else who was planning on attending. Because of this, I decided to come in without a roommate, otherwise known as ‘going potluck.’ I filled out my housing form and prayed that the Lord would lead me to a lifelong friend and the most amazing roommate ever. I pictured us decorating our room in corresponding colors and staying up past midnight sharing secrets. As you can tell, I was pretty naive to how the real world works then. That was not what happened. I want to preface this story by saying that I still occasionally see my freshman year roommate. If she is reading this, I want her to know that I appreciated our time together and that I think she is an amazing person. We just weren’t amazing people for each other. Our first semester living together was one of barely speaking and living two very separate lives. I loved our quaint little dorm room in Phelps Hall; she didn’t really like being their very much. I enjoyed being on campus 24/7 and didn’t really see my family very often; her mom is her best friend and she went and slept at home a couple nights a week. I didn’t particularly mind our arrangement. I thought it was okay. However, I don’t believe that she did. About a month into our second semester, my roommate sent me a text asking if we could chat that evening. She hadn’t been sleeping in our room for the past couple nights, so I thought she just wanted to catch up when she got back. When I arrived back at our room, she asked me to sit and explained to me that she had decided that she no longer wished to live in the dorms and was moving back home. She said that being in a dorm gave a bit of anxiety that she couldn’t shake. I had no idea that she had felt this way. I was shocked. She said she was leaving and wanted to give me my space to process and understand her decision. After she left, I went and bawled in my friend’s room for the next hour. Once she had moved out, I lived alone for the rest of the year. Being unsure what I was going to do for housing the next year, one of my good friends set me up with a girl also looking for a roommate. We hung out a couple times and found we really liked hanging out with each other, enough to live together. Now, she is one of my best friends and my roommate of two years. Having seen both sides of the spectrum, the loneliness of not having a roommate to someone who I can talk to about anything, has truly made me into a better R.A., friend, and person. If you’ve made it this far in my story, stick with me for a moral. No matter how your roommate relationship goes, I want to let you know what I didn’t then. What I didn’t understand was that her decision to leave had nothing to do with me. It wasn’t that I was a bad roommate or a bad friend; she just needed to find a space where she could be comfortable. My space was the dorm; her space was at home. Going our separate ways made me better and I cannot thank her enough for that.